Xiaomi is all set to unveil yet another variant of the Mi Note series, talking about the Xiaomi Mi Note 5. We have heard about Xiaomi’s intention to jump Mi 7, and launch Mi 8 instead. But it seems the company will be jumping the Mi Note 4 as well, to launch Mi Note 5. 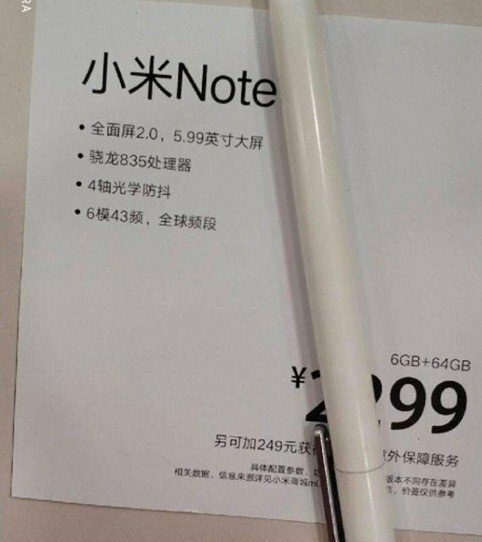 While we currently have no accurate information regarding when this device will actually go official, rumor has it that Xiaomi might announce the Mi Note 5 along with the upcoming Xiaomi Mi 8 smartphone in it upcoming 8th year anniversary event in China on the 31st of May, 2018. 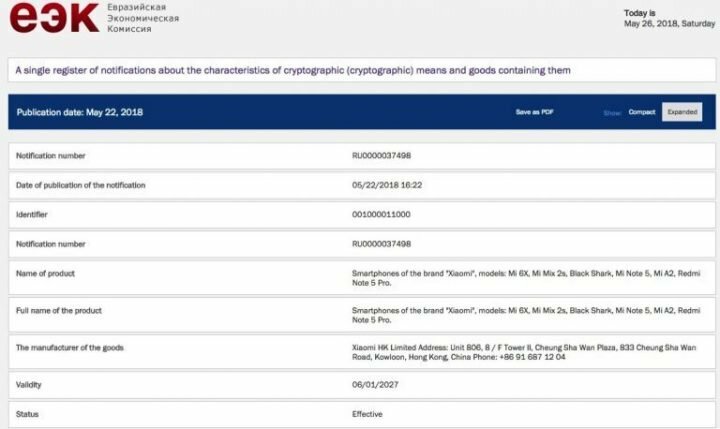 In a recent leak, the name of the Xiaomi Mi Note 5 smartphone was seen on the website of Eurasian Economic Commission (EEC) among few other Xiaomi phones intended for launch in Europe. The Xiaomi smartphones to be launched in Europe are Mi 6X, Mi MIX 2s, Black Shark gaming phone, Mi A2 and Redmi Note 5 Pro, and of course the Xiaomi Mi Note 5. We are already familiar with most device mentioned above, aside the Xiaomi Mi A2 and the Mi Note 5. Without doubt, the Mi A2 is going to be the Android One version of the Xiaomi Mi 6X, specs of which we already know. Then the Mi Note 5 on the other hand is expected to feature a 5.99-inch Full-HD+ display, using what Xiaomi calls “Full Screen 2.0 design”. The Xiaomi Mi Note 5 will run Qualcomm Snapdragon 835 mobile processor, along with Adreno 630 GPU, 6 GB of RAM and up to 128GB internal storage. The smartphone is expected to feature a dual rear camera setup along with 4-axis optical image stabilization. The smartphone is said to come with support for global LTE bands. As mentioned above, the Xiaomi Mi Note 5 is expected to be announced on the 31st of May during the Xiaomi’s 8 anniversary event in China. The device should be available in multiple variants including 4GB+64GB/6GB+64GB and 6GB+128GB storage options. 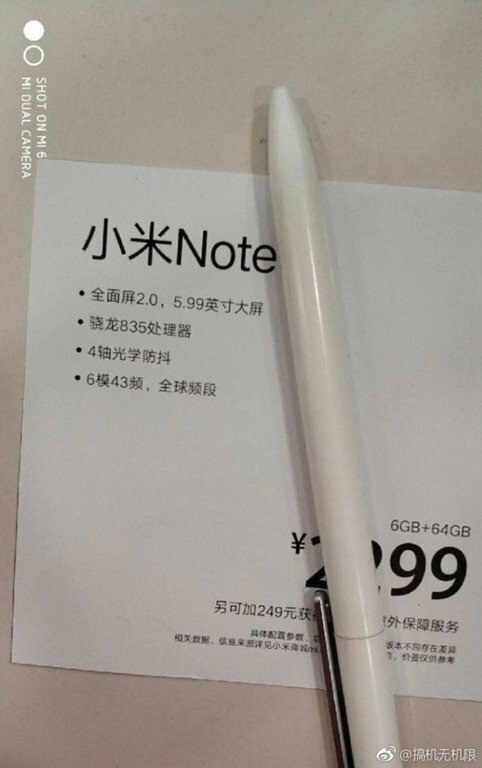 As far as pricing is concerned, the Mi Note 5 featuring 64 GB of storage and 6 GB of RAM will carry a price tag of 2,299 Yuan (~$359) in China.